Friends and blog readers may not know I've taken a lot of comedy classes recently at the ImprovBoston theater here in Cambridge, MA. It's a great way to decompress from office work, goof off on stage, and meet like-minded people. My latest teacher is Will Luera, who works as both engineer and improv instructor now, but served up some baseball history for me in an 11-minute story about one of his first jobs as a high schooler in Chicago. Five things I learned from Will's story. 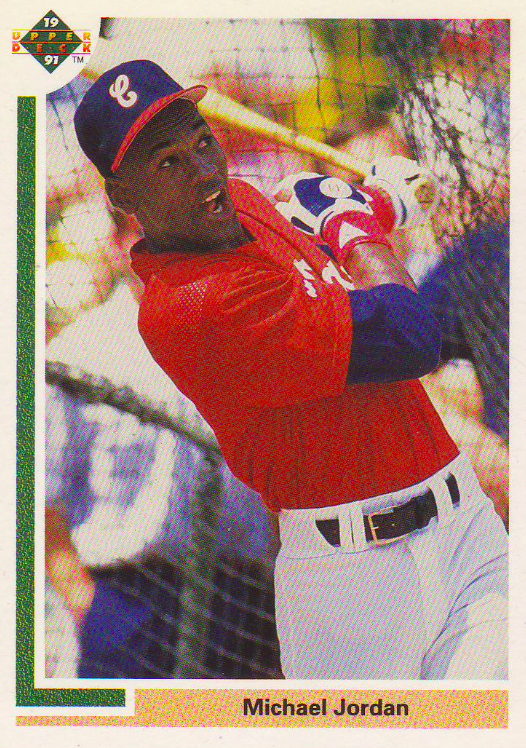 Will couldn't ID the precise date he ushered for Bo Jackson, but did recall a big homer by current manager Robin Ventura, then a young 3B for the Pale Hose. That's an easy one to find, because of the drama. It was a game-winning, two-out slam off Ranger closer (and future Hall of Famer) Goose Gossage. That happened on July 31, 1991 and here's the full video experience. Every collector would love to replicate Will's story of seeing a big money card in the store's display case (Michael Jordan's 1991 Upper Deck baseball rookie) and pulling it from a pack in person for a hundredth the price. Anyone else find this in a 1991 pack? Jordan's sporting a bright color combo you don't see often these days. Thanks for the baseball stories, Will! I have pulled two of those Jordans from packs. Have them both in my binder. I busted a ton of 1991 Upper Deck... and pulled a few of these. It's still one of my favorite cards. It's a hard card to forget, once you've seen it. Full credit to those bright colors! Wait, is Will Luera telling a real story or is he improving? Andy Frain is still around.